You might need to build these to have the best New Years Eve ever! Goodbye LEGO MINDSTORMS Community Gallery, you nurtured and inspired generations of LEGO builders. NXT to Christmas, Halloween has to be my favorite holiday. Halloween is full of robotic inspiration. Ceej Reilly and I agree some of our favorite projects came out of these challenges. Gotta love animatronics of all kinds. 31 robots in 31 days: Robot # 25 Rock 'em Sock 'em Robots by legoboy2562 for the NXTLOG Icon Building Challenge. What robots can be more iconic than the classic Rock 'em Sock 'em Robots - made here with LEGO System and LEGO MINDSTORMS NXT. The LEGO MINDSTORMS Community Gallery hosted seven holiday building challenges since 2008. Three graphic designers worked on these projects: Scott Gursky, Ceej Reilly, and I pitched in when CJ was working for the Peace Corps in Nepal. Here's are seven holiday robots, one featured from each of the challenges. Happy Holidays to all! In 2017, the LEGO MINDSTORMS Gallery team asked members of the community to share ideas for building challenges. The_Icestorm suggested a Space Race Challenge, and we launched that this past April. The_Icestorm submitted a number of projects to this challenge, including three of may Star Wars models they have #madewithMINDSTORMS. The_IceStorm has shared 43 robots in the LEGO MINDSTORMS community gallery the past three years. Enjoy BB8, The Millenium Falcon, and an AT-AT Walker, and go see The Last Jedi, it's awesome! 31 robots in 31 days: Robots # 14 - Space Pinball! For robots 12 & 13, I am profiling one amazing builder I admired from the LEGO MINDSTORMS Community, LeoBello. This builder was a member of an FLL team and FTC team and contributed about 30 robots between 2007-2010. LeoBello combined form and function in their robot designs. 1) Mastering engineering a robot that balances and drives on two wheels. Enjoy the NX Trike and NXT Bike by LeoBello. I bet you are an amazing adult wherever you are. Thank you for sharing your brilliance. Three robots to share from the Earth Day Challenge back in 2008. This challenge was dear to my heart as a teacher to see robot designs that can be used as inspiration for class projects to help save resources at school and home. Each creator worked from their imaginations and used no building instructions. The SwitchBot by cdgallahue really works in a kid's bedroom and turns on and off the lights based on your movement. The Plant Waterer by mperrin connects a large 40 tooth gear to a pneumatic pump and a recycled water bottle. The Generator bot by arclegoman12 shows that you can make people with LEGO TECHNIC and generate enough power to illuminate the lights in a light sensor. 31 robots in 31 days: Robot # 8 Christmas in LEGO City by Jakeb1543 was the only project this builder shared on the MINDSTORMS Gallery. 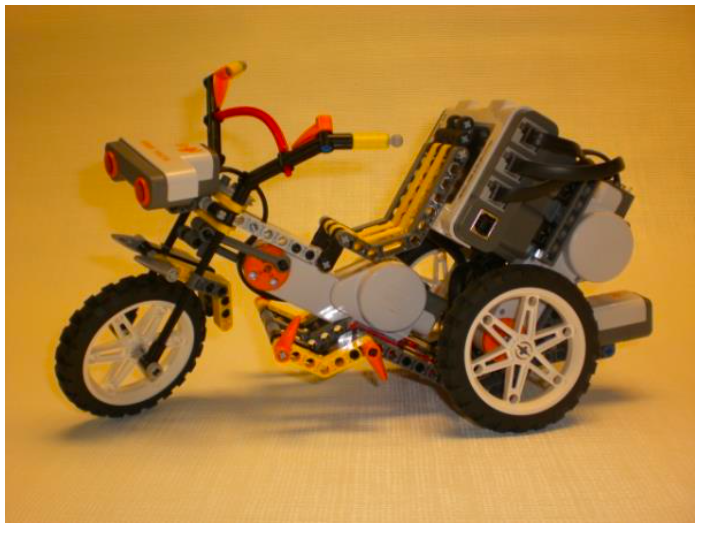 This project makes LEGO system bricks come to life with MINDSTORMS (something I love to see). "The house conceals the NXT brick, motors, wires etc. In front of the house is a large Xmas tree which turns slowly. Under it are some presents which move when the tree turns. On the balcony are a choir of minifigs and a band. The NXT is programmed to play Silent Night. On the other side is Mary, Baby Jesus and the 3 wise men. The manger rocks and an angel slowly flies up and down above it. Right in the front is a giant Santa who waves merrily at everyone who passes." 31 robots in 31 days - Robot #7: Mouse Bot by LegoManIAm94 for the Cool Creature Building Challenge, the 14th challenge on NXTLOG, September 2008. This robot was designed to entertain the builder's cat. It also represents some of my favorite things in a robotics model: connection to the real world, personification, hiding the magic (but having a trap door to peek inside), hackability, and funny animal videos! LegoManIAm94 uses third party hardware from Mindsensors.com to remote control the bot using a Playstation 2 controller. 31 robots in 31 days - Robot #6: Bipedal Dragon Prototype by Billy259 for the BiPed Building Challenge, the 10th building challenge on NXTLOG. This challenge was designed to inspire the LEGO MINDSTORMS Community to creatively engineer walking robots on two legs - no easy task! Billy259 was an influencer in the early days of the LEGO MINDSTORMS Community and inspired a lot of builders with his mech and Bionical infused builds. I love the expressions this Dragon makes! The Dancing Snowman by Mini_Man176 won the Champion’s Award in the 2008 NXTLOG Winter Wonderland building challenge. I love the simplicity of this robot and the creative personification. There were over 100 entries to this challenge. In August 2007, LEGO WINDSTORMS expert Steve Hassenplug pitched an idea to Steven Canvin and I, to host an online LEGO MINDSTORMS NXT Sumo competition online and have a group of MCPs (MINDSTORMS Community Partners) build and run a select # of Sumo robots in a weekend sumo hackathon. MCPs Hassenplug, Brian Bonahoom, Brian Davis, John Brost, and Jay Hiram Kinzie built and ran the robots and I was there too to document the work and make sure everyone was playing fair. Today's featured robot is the 125 Sumo Robots from 19 countries entered into this competition and to the MCPs who cared enough to host, build, play, and inspire. 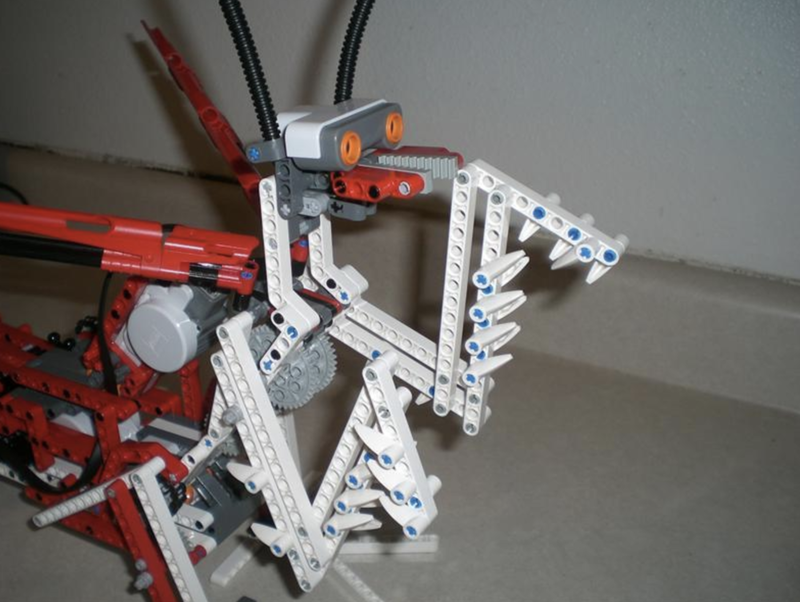 Today's featured robot, honoring the legacy of the LEGO MINDSTORMS Community Gallery: Praying Mantis by GhostInside. This project was submitted in June 2007 as part of the 2nd building challenge posted on NXTLOG, the Quadruped Building Challenge. GhostInside shared 10 robots on NXTLOG and they all show this maker's thoughtful design process. The LEGO MINDSTORMS Gallery is being retired as of January 1st. I have created about 75 unique building challenges for this site. These challenges have inspired 1000s of amazing LEGO MINDSTORMS builders and creations. I am going to try to feature a favorite creation and challenge from the gallery a day. Today's featured robot is selected to get us all in the holiday spirit. It's from the 2008 NXTLOG Holiday Building Challenge and features Vassilis Chryssanthakopoulos (NeXTSTORM) Magic Christmas Tree. Enjoy!